It's said that there's a "curse of the Flatirons," the calling travelers feel to return to Boulder after experiencing it once. Maybe it's the mountains. Boulder is located right at the base of the foothills and a short drive to the Eldora Ski Resort. Maybe it's the hiking trails, the historic buildings, the yoga. Boulder's got international film festivals, world-renowned chefs, healthy food, pet-friendly hotels and a quirky charm we can only describe as "only in Boulder." It's hard to put the finger on one reason why Boulder's tourism continues to grow and so many people want to live there. Here are just a few of the best things to do in this Front Range city. Boulder has amazing trails through the foothills, along the Boulder Creek, and through town. The city is buffered by open space and nature, so it's not easy to find a way to connect with the beautiful Boulder outdoors. In the summer, it's common to rent inner tubes and go tubing down the Boulder Creek. While this can get a bit dicey (the creek can run pretty fast and there are some sharp rocks along the way), visitors can also take a dip in the calmer stretches of the creek or go swimming in Boulder Reservoir. 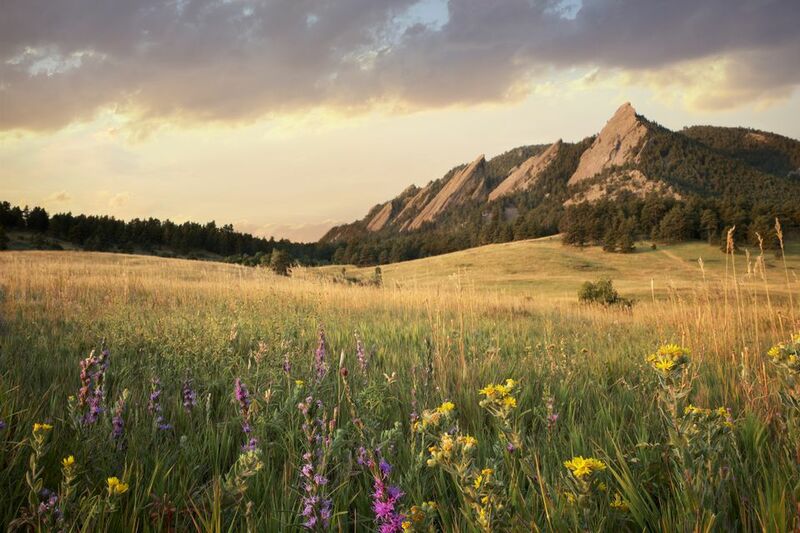 One of the most popular places to hike is Chautauqua Park, right under the shadow of the Flatiron Mountains. Grab a coffee at Trident Coffee and find a seat on a bench or on the courthouse lawn. Relax under the often-blue sky and enjoy the upbeat, energetic vibe of this crazy downtown. Boulder County has more than 50 different breweries and taprooms to choose from, and Boulder is the home of several craft beer festivals and brew tours. You can also find reputable bartenders whipping up creative cocktails in unique bars, such as License No. 1, a speakeasy-style bar underneath the historic Boulderado hotel. This bar was supposedly the first place to get its liquor license back after the Prohibition. There's also the extra unusual Shine Restaurant and Gathering Place, whose cocktails take the shape of "potions" that contain healthy herbs and are also made with "intentions" and "sound frequencies." Boulder also boasts some great happy hours (where you can score $4 margaritas) and rooftop bars with views of the mountains. The Lazy Dog and the Rio Grande Mexican restaurant are two favorite spots to kick back with a cold one and watch the sunset from the rooftop. Boulder has been named the "foodiest town in America." Here, you can find James Beard award-winning chefs, as well as a restaurant run by one of the "Top Chef" reality TV shows. Find seafood and oysters flown in fresh daily, plenty of vegan and vegetarian options and menus that center around restaurants' very own local gardens. One top recommendation: Oak at Fourteenth. This popular restaurant, located right off Pearl Street, rotates its menu daily and offers shared, small, large and family plates to choose from. If you're lucky, you'll find grass-fed, free-range Oak Roasted Boulder Natural Chicken, squid ink spaghetti or the to-die-for tomato braised meatballs served atop locally made, gluten-free grits and made-in-house stracciatella cheese. Wash it down with house-made soda or the Steph cocktail (Reyka, St. Germain, Aperol and grapefruit), always on tap. Bonus: Oak makes up different flavors of fresh donuts every morning, and late night, get free, giant, flavored pretzels with your drink. Boulder has been named the third top place for working artists to live in the nation, and you can see signs of that all over town. From the bustling Dairy Arts Center with its multiple galleries and stages to the well-known Boulder Museum of Contemporary Art, to the colorful street murals and sculptures that adorn the city, art is everywhere here. If you're in Boulder over the summer, make it a top priority to get tickets to the Colorado Shakespeare Festival, where you can watch the famous performances on an outdoor stage under the stars. Boulder has been named the fittest city in America and has a long list of, well, lists recognizing it for its health and fitness. Boulder also happens to be a hot spot for pro and competitive athletes to live and train, and it's home to the annual Hanuman Yoga Festival that draws yogis from all over the globe. It's simply not a Boulder vacation without tapping into that healthy vibe. Plan an outdoor adventure or book a yoga class with world-famous yogi Richard Freeman. Rent a bike (you can find red B Cycles at stations all over town) and explore the city via wheels. Hike Mount Sanitas for a sweeping, panoramic view of Boulder and the University of Colorado. Or sign up for some of the many athletic competitions in town, like the annual Bolder Boulder (a party on the street that ends with a can of beer) or the harder core Iron Man race. Boulder is also a popular place to go rock climbing (both indoors and out), do aerial dance (one of the world's top schools is based here), or try parkour, pole dancing, Kundalini yoga, meditation, stand-up paddleboarding, and more. Every day is an adventure in Boulder, and it seems there's always a new way Boulderites are getting active. Boulder's foodie scene isn't limited to the stuff you can chew. It has a thriving nightlife scene, too. You can find innovative, impressive and expertly crafted cocktails throughout town. For something totally unique, see what the bartender is mixing up for the day at Bramble and Hare. The cocktail list (and food menu) change up constantly based on what's in season in the owner's nearby garden. Cocktails here are often made with herbs, spices and food leftover from preparing dinner. You might find cocktails centered around beets, asparagus, dill, you name it. And somehow, they all taste amazing. Boulder's music scene is impressive. The main venues to catch big-name musicians include the Boulder Theater downtown, Fox Theatre on University Hill, the Macky Auditorium on the University of Colorado campus, the Chautauqua Auditorium in the foothills and eTown Hall, which records live radio shows, as well. While Boulder doesn't have a ton of luxury hotel spa resorts, it does have one that's destination-worthy: the St. Julien Hotel and Spa. This award-winning spa hotel has a large and high-end spa with some interesting offerings, including a vegan treatment and even products made out of herbs from the hotel garden. Don't miss the social-media-famous nail technician in the hotel's salon. Katy Parsons is an acclaimed nail art genius. Boulder loves its brunch, and brunch loves Boulder back. There are so many great places to brunch in town that it's hard to narrow them down. Snooze on the Pearl Street Mall always has a long line, especially on weekends. For an elegant and sophisticated brunch, check out the Greenbriar Inn, with its white table cloths and champagne. For something creative, Centro serves up Latin-influenced breakfast dishes and a heck of a spicy Bloody Mary. Boulder is known for being quirky. So when in town, it's only appropriate to get a little weird yourself. Visit a pet psychic. Take a trapeze class. Try to fool the "Zip Code Man" on the Pearl Street Mall, who knows every zip code in the world. Stay in a hotel made out of tiny houses. Join the fairy parade during the annual Tulip Festival. Go on a costumed cruiser bike group ride. Visit the haunted bar next to the Boulder Theater. Visit Shoes and Brews, a shoe store with a brewery inside, and race for the price of your pint.